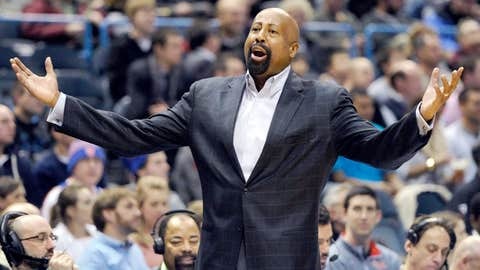 "I don't think they're tuning me out," Knicks coach Mike Woodson says about his players. MINNEAPOLIS — The losses, the distractions, the disappointments. They all keep coming for the New York Knicks in a season fast taking on the look of one that can’t end soon enough. In the face of it all, coach Mike Woodson is steadfast in his belief that he’s the man to lead the Knicks out of the abyss. The Knicks have lost seven straight games to fall to 21-40, a slide that has buried them in 11th place in the Eastern Conference with 21 games to play. Naturally, Woodson’s job status has become a hot topic while a team that started the season with big expectations unravels right in front of him. ”I don’t think they’re tuning me out,” Woodson said about his players. ”They’re still listening. We’re just not getting it done on the basketball floor, and that’s the frustrating part about it. The problems have been many for the Knicks, who won 54 games last season and advanced to the Eastern Conference semifinals. They have had injuries to key players, J.R. Smith’s suspension at the beginning of the season and inability to replicate last season’s breakout year and their latest distraction — point guard Raymond Felton’s recent arrest on gun charges. Felton is 7 for 32 from the field since his arrest, and Woodson said he spoke with his struggling point guard at length on Tuesday to try to help him through his troubles. ”I feel for Raymond because only he knows what’s going on in his heart and mind in terms of how he’s feeling and I don’t wish that on anybody,” Woodson said. ”But again, my job as the coach is to shelter and pat him and try to keep him upbeat. That seems like a lot to ask, as does even thinking about the playoffs right now. The Knicks are 6 1/2 games behind eighth-place Atlanta (26-32). After the game Wednesday night in Minnesota, they do hit a soft spot in the schedule with Utah, Cleveland, Philadelphia, Boston and Milwaukee all coming up. That’s about the only hope the Knicks were clinging to Wednesday morning. Woodson took part of the blame, saying he has ”failed somewhat” to help his players navigate all the negative issues — on and off the court — that have enveloped the team this season. As the season has worn on, and the winning streaks have been few and far between, it appears the weight of expectations has started to stifle the Knicks. Now they’ve gone from a team that expected to contend to a team that is merely trying to survive.